The Read Music Today: Vol. 1 instructional video is the first of two volumes featuring expert music teacher Paul Wayne Beach explaining the basics of musical notation. Volume one is designed to be the viewer's first experience with music theory. Information covered includes how to understand notes, scales, intervals, triads, and chords. This program also provides a section on "Harmonic Analysis," in which Beach discusses everything that can happen in music in one instant of time. 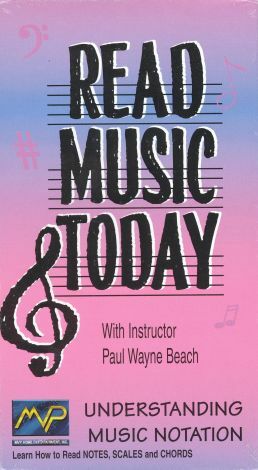 Beach has written that he disagrees with the title Read Music Today, believing music to be "too complex and dynamic for anyone to completely understand it in a day." Originally he wanted to title the program "Understanding Music Notation." Regardless, Beach designed the two videos to be used together. While this first tape explains sounds, Read Music Today: Vol. 2 deals with the "Theory of Rhythm," or how the sounds go through time. Beach believes that the information from both videos is needed in order to gain a solid foundation in the basics of music theory.